Auckland, 16th May 2005: Epson New Zealand has released the Epson STYLUS PHOTO R1800 A3+ inkjet printer with a range of sophisticated hardware and software enhancements aimed at delivering durable picture perfect photos for professional and expert amateur photographers and digital fine art enthusiasts. The STYLUS PHOTO R1800 extends the features of Epson's award winning STYLUS PHOTO R800 A4 inkjet printer into the larger format now popular with sophisticated digital image creators, using the same UltraChrome Hi-Gloss pigment ink set with enhanced colour gamut and long photo life on selected Epson papers#. "The STYLUS PHOTO R1800 directly addresses the needs of the increasingly sophisticated high end digital camera user and professional photographer, allowing greater control over the image through the printer, while at the same time increasing print size and speeds on a wider range of high quality media," Epson's Marketing Manager, Anjna Patel, said. Sophisticated enhancements on the STYLUS PHOTO R1800 include: Epson RAW Print; Epson Darkroom Print; three new Print Modes - Adobe RGB mode, Auto Photo Enhance Mode, and ICC profile workflow; a new paper path to handle heavier weight fine art papers; four sided BorderFree photos on roll or sheet paper; and direct CD/DVD printing. The two new print workflow functions on the STYLUS PHOTO R1800 allow greater control over image parameters to produce optimum results, ensuring that the high resolution, broad colour gamut, and subtle tonal gradations captured by high end digital cameras are reproduced in A3+ size photos on high quality paper by Epson's UltraChrome Hi-Gloss ink set. Direct print from RAW files captured by high end digital still cameras without special RAW development software. The result is very high quality photos using the latest image processing software developed for photographic output, giving the extensive and subtle tonal gradation in the photo that is available from the RAW data. The Epson software delivers a consistent colour policy and image processing in the Adobe RGB colour space to ensure no loss of image quality. Supported by Windows® 2000 and XP, Epson RAW Print works with these cameras: Nikon(R) D70 and Canon(R) EOS Rebel. Epson Darkroom Print is a software application that simulates an analogue darkroom process without complicating the choices. It provides an easy way for users to quickly print digital images on various kinds of paper, making detailed adjustments to the layout, and printing out a sample to check the colour tones. The easy to use software lets users work through the operations one by one to make print settings and preview the printout image. With the Sample Print function, users can print out a sample of different colour tones on one sheet, and choose the preferred colour tone for the final print. The STYLUS PHOTO R1800 also has three new Print Modes: Adobe RGB mode; Auto Photo Enhance Mode; and ICC profile workflow; as well as the usual modes of Epson standard and Epson vivid. Adobe RGB mode is suggested for professional and expert photographers using digital SLR cameras and high end digital still cameras that operate in the Adobe RGB colour space. With this mode selected the printer colour gamut is optimised and the photo output displays the wide colour space [gamut] captured by these cameras. New Auto Photo Enhance Mode is for users who want brilliant photos without going through a complicated retouching process. The Epson auto photo enhance engine automatically retouches and enhances photos to make optimal use of the wide colour gamut available with the seven colour UltraChrome Hi-Gloss ink set. It also has automatic scene detect so, for example, when the image is detected as a landscape, edges are sharpened and greens and blues are more saturated. When the software detects the image as a portrait, it makes the tones softer and brighter with a more natural skin colour. ICC Profiles Mode is for Windows and Macintosh users who want the colours on the retouched image on the screen matching those on the printout. This mode is for users who are knowledgeable about digital workflow and retouching techniques. These software enhancements are complemented by the Epson UltraChrome Hi-Gloss 7 colour plus gloss optimiser pigment inkset, which ensure the STYLUS PHOTO R1800 produces superb quality and highly durable photos on a wide variety of Epson fine art and photographic printing papers at up to A3+ size. Epson papers compatible with the STYLUS PHOTO R1800 include: Premium Glossy Photo Paper, Premium Semigloss Photo Paper, Archival Matte Paper, Velvet Fine Art, Matte Paper-Heavyweight, Double-Sided Matte Paper, Photo Quality Ink Jet Paper, Premium Lustre Photo Paper, Watercolour Paper - Radiant White, and Premium Bright White Paper. Archival quality is assured, with photos on Epson's Matte Paper-Heavyweight resisting fading for more than 150 years#, and up to 300 years# on Epson Premium Glossy Photo Paper when kept in "dark storage" environments such as photo albums. In addition, the rating for Epson UltraChrome Hi Gloss ink on Epson Premium Glossy Photo Paper has recently been updated to 104 years# in normal lighting conditions. The STYLUS PHOTO R1800 is capable of printing directly onto inkjet printable CDs or DVDs. Users can create their own CD or DVD designs with the included Epson Print CD software, then simply place the disks in a tray that slides through the printer's front-loading CD tray. The Epson STYLUS PHOTO R1800 is priced at $1399 RRP and is available through Epson dealers and major retail outlets. 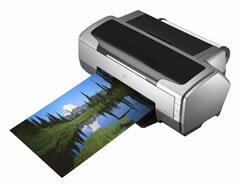 For full product specifications on the STYLUS PHOTO R1800 and other Epson products please visit www.epson.co.nz. # Lightfastness results using Epson UltraChrome Hi-Gloss ink set of 104 years on Epson Premium Glossy Photo Paper, and more than 150 years on Epson Matte Paper-Heavyweight, based on accelerated testing of prints displayed indoors, framed under glass. The 300+ year rating on Epson Premium Glossy Photo Paper is based on accelerated testing in dark storage. See www.wilhelm-research.com for test details and information on other Epson papers. Actual print stability will vary according to display conditions, light intensity, humidity and atmospheric conditions. Epson does not guarantee longevity of prints. For maximum print life display all prints under glass or properly store them.